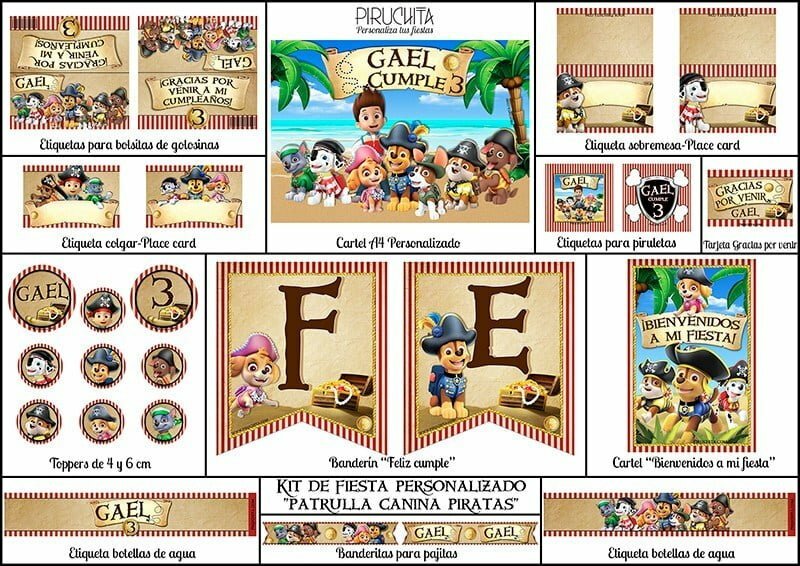 Download the Card to invite Patrulla Canina / Paw Patrol birthday by Whatsapp, e-mail or print. Available in Spanish and English. 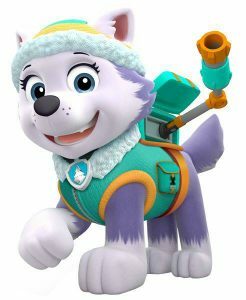 If your son is crazy about Paw Patrol, do not hesitate to put on his birthday party full of educational puppies. With what to start? 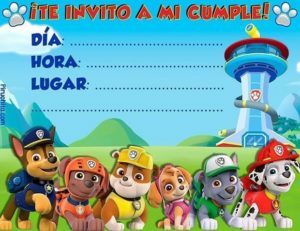 The first thing is to have ready the invitations for your friends and family, and for this you can use this Paw Patrol Birthday Invitation that we offer you for free. 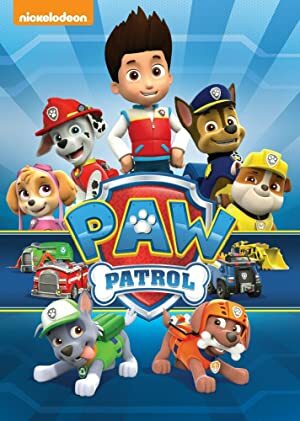 The dog patrol, also known as "Paw Patrol"(Your original name) or"Puppy patrol"In Latin America it has become one of the greatest television successes of recent times. This series of cartoons has its origin in Canada. Its great protagonists are dog puppies who perform all kinds of community activities and rescue, with which the youngest will learn to appreciate and value the work done by the police, firefighters, rescuers, doctors, etc. IMDB is Internet Movie Data Base. The largest online database of movies, series, drawings, anime, etc. It includes two types of assessments, that of the specialized critic and that of the visitors. This can make you a very good idea of ​​the reception that this film has had worldwide, as well as read the opinions of many participants, but OJO, it is common for some spoilers to escape. Although originally they were only 6 puppies Chase (Dog Police), Marshall (Fireman and Doctor), Rocky (Recycling), Zuma (Aquatic Rescues), Rubble (Construction), Skye (Air Rescues), from the second season joined them a seventh called Everest (Mountain Rescues). Everest in Spain is not well known as it has not been seen on public television where only the first season is broadcast, only on pay channels like Nickelodeon can be seen, so here is a picture in case you do not know it still. Currently they are going for the third season, and each of them has a total of 26 episodes. Do you want us to personalize the Dog Patrol Birthday Invitation? La Paw Patrol birthday card to celebrate the birthday of the child has to be striking and colorful. Just that is what you have here, a birthday invitation from the patrol beautiful and capable of thrilling your son and all his friends. You just have to download it, print it and fill in the details of the party by hand. Now, if you do not have time, and also prefer something more elegant, that is not written by hand, we can also customize the texts ourselves. It can not be cheaper for a customized product. For only 7,95 € (9.95 € photo versions) get it in just 24 / 48h. Get a beautiful printable and personalized decoration for the birthday party on Patrol Dog. To the family, friends, parents of the friends of your child, but above all and mainly to your son, that for something that day will be the protagonist. You know it, it deserves the best, and although sometimes it takes you out of your boxes, it has you in love with your love, hugs and kisses. This is only once a year, and he has earned it. Show him your love by giving him the best party of his life. We only do a small part, and it is to give you the necessary tools. Then you are the person in charge of devising the order to decorate everything, print, cut and place everything in its place. For this, you have Premium Decoration Kits for Dumbo birthday party that we can customize for you with the name of the birthday boy / girl. You can get it here for only 19,95 € and in a working 48h term you will receive it in your e-mail. All ready for you to print what you want and as many times as you need, without limit of uses. 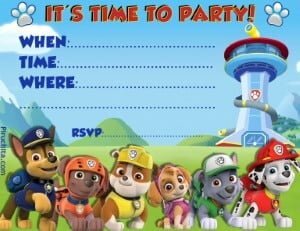 La Paw Patrol Birthday Invitation is designed in high quality, 300 dpi, perfect for printing both at home with any type of printer, as well as in a printing or online printing service. If you are going to print the Invitation, we recommend that you use paper a little thicker than the typical ones that we have at home, since with this paper it would be excessively thin. If you can, get some 220gr paper in brightness (also called glossy). EYE, it is not necessary to look for it to be specific to photography since they tend to be more expensive. The default invitation size is 7 "x 5" inches (17,78cm x 12,7cm). Yes! It is huge, but this is so that when you print them to a smaller size, the quality is excellent. You can then reduce the size at the time of printing, eg. 6 "x 4" inches (15,24cm x 10,16 cm) or even less. We recommend that you print 2 for each sheet of size A4, which is a large size but will be more striking than normal tiny. You can also reduce them more and put 4 per sheet, and save if you have many guests or have only got expensive photo paper, but keep in mind the size of the text as it will be, so before doing anything on good paper, it is always advisable to print on a normal sheet and see how it will look. The content of this site can not be printed.